In the run up to Eric Baudelaire’s first institutional survey exhibition The Music of Ramón Raquello and His Orchestra at Witte de With in Rotterdam, the artist and filmmaker speaks to Anna Gritz about the transient materiality of his practice, cross-temporal artistic collaboration, and the importance of “exploring a space in between understanding and the impossibility of understanding” in a time so fixated on quickly drawn certainties. ANNA GRITZ: Eric, was there an underlying narrative basis for the selection of works for the forthcoming exhibition at Witte de With? How do the pieces that you are bringing together in this show engage in conversation with one another? ERIC BAUDELAIRE: The show’s title is an homage to Ramón Raquello, the fictional bandleader whose radio performance was continuously disrupted by newsflash broadcasts announcing an alien invasion in Orson Welles’s rendition of the War of the Worlds. It was 1938, tensions were mounting in Europe, and the world was on the verge of a great tragedy. Ramón’s band had hardly begun playing “La Cumparsita” when an announcer cut in: “Ladies and gentlemen, we interrupt our program of dance music to bring you a special bulletin from the Intercontinental Radio News.” I decided I wanted to give back to Ramón what belongs to Ramón, and open the show with his music spliced back together (devoid of Welles’s Martian invasion). It’s playing on a radio in the stairway of Witte de With. Gathering works from the past ten years for the show has been a chance to rethink what ties things together. In a broad sense, it’s mostly been about the relationship between words and images, and seeing what happens when you disrupt their synchronicity. This is something I’ve been very interested in doing when editing films: opening up a space between the narrative carried by the sound, and the stories embodied in the images. Cinema is usually based on synchronicity between the two. When they contradict each other, different possibilities emerge. The show was also a chance to connect this idea that has been important in my filmmaking with related experiments between text and image in works on paper, silkscreens, and collages sourced from newsprint, academic journals, and magazines. I’m engaged in an ongoing series made from the French daily Le Monde, which is released in the afternoon and dated for the following day. I like the idea that news of today is dated for tomorrow. 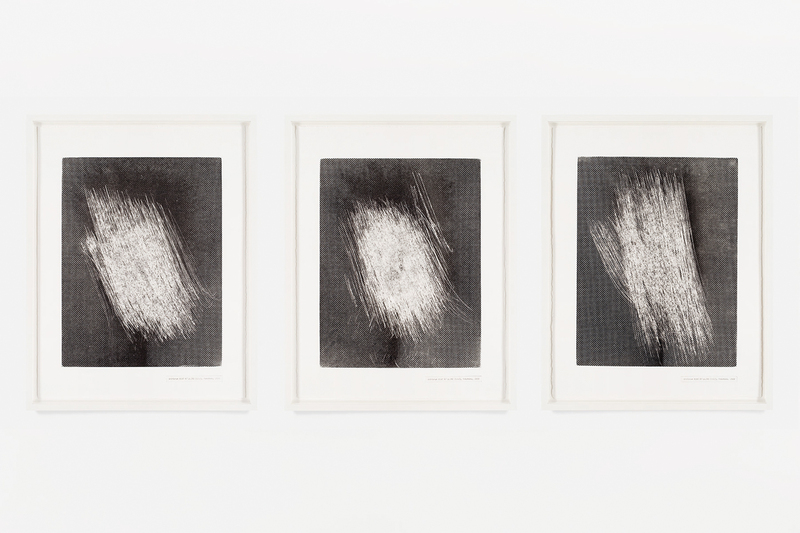 The works are silkscreens on glass of pictures culled from a single issue of Le Monde, mounted on top of a silkscreen on paper aggregating every word from the same pages of the newspaper. 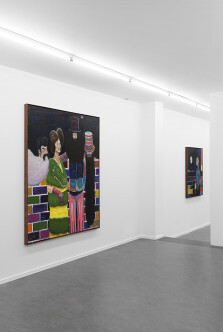 The series is called “Some Tomorrows” (2006-ongoing), and we have paired them up, throughout the exhibition space, with other works made the same year. It was a way of tying the works in the show to a broader context of current history. 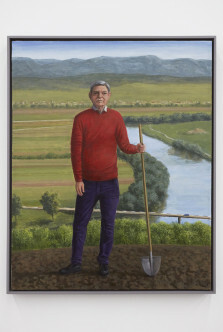 Another important decision was to bookend the show with two works that explore the poetics and politics of landscape. 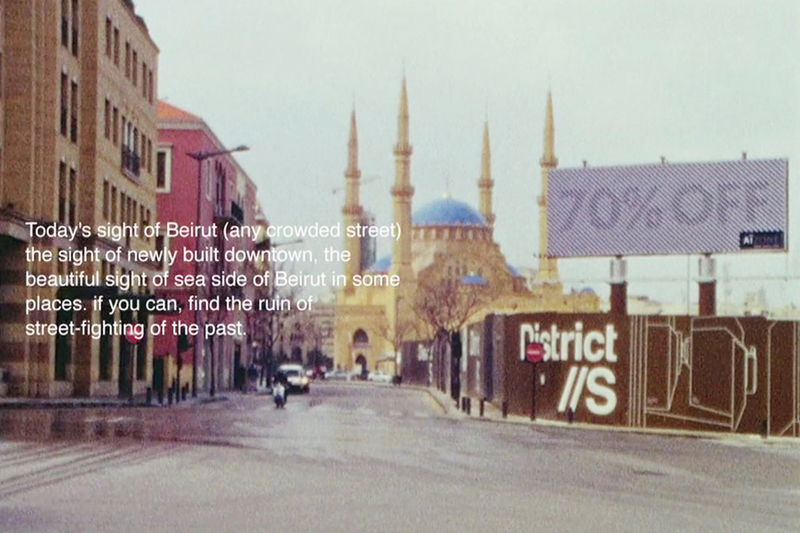 The earliest work is a dual slide projection from 2007 called Site Displacement / Déplacement de Site, and the latest is the barely completed film Also Known As Jihadi (2017). AG: The act of restoring Ramón Raquello’s performance to a unity that never actually existed reads like a form of fictional archaeology. 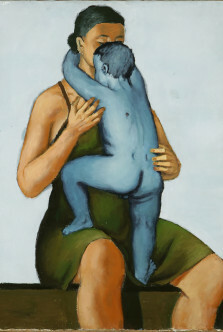 It suggests the possibility for artistic creation to outlive its creator in the work of another artist. 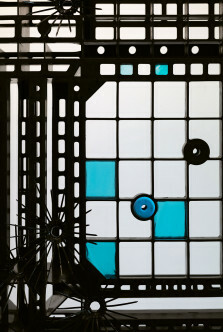 The gesture exemplifies your tendency to collaborate with and rework historic material, something that is also addressed as a larger cultural practice in “Of Signs and Senses”(2009). EB: Honestly, I don’t have a good sense of what exemplifies the work. I know that I’ve always been drawn to fictions that have documentary tendencies, and documents that open fictional pathways. But several things surprised me when hanging the show at the Witte de With. My studio isn’t very big, and I don’t have much of my own work beyond their JPG or MPG versions on a computer. Seeing so many physical pieces in one space gave me a different feeling about what I’ve been spending a lot of time doing in the past few years. 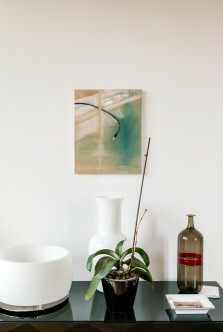 One of the things we joked about with Natasha Hoare when hanging the show is that so many of the images aren’t mine. They are found, appropriated, collected, reorganized. But the way I use them turns them into a kind of ad hoc collaboration. “Of Signs and Senses” is exactly that: the work starts when I find images reproduced in European art and fashion magazines sold in Japan. These images have been scratched to rub off the ink on the genital areas of the bodies. A very delicate scratching has sought to make the pictures less “obscene.” This led me to research the legal concept of obscenity in Japan, defined by the Japanese Supreme Court as “that which unnecessarily excites or stimulates sexual desire.” The question of the necessity or non-necessity of desire is quite a program. The follow-up question of what, in an image, excites desire is another wonderful program. So I collected magazines with scratched bokashi (the name for this hiding of the zones of the body that need to be hidden). When I returned to France, I blew up these scratched zones and printed them as large heliogravures: a personal library of zones that anonymous scratchers identified as “unnecessarily exciting desire.” And so yes, indeed, the work is in a sense a collaboration between the people who made the original images (for example Robert Mapplethorpe or Juergen Teller), the anonymous Japanese magazine distributor’s employee tasked with scratching them, and myself. AG: Watching the new film Also Known As Jihadi in the aftermath of the recent attack in Berlin resonates in a particularly somber tone, especially knowing that the idea for the film originated in the days following the massacre in Paris in November 2015. 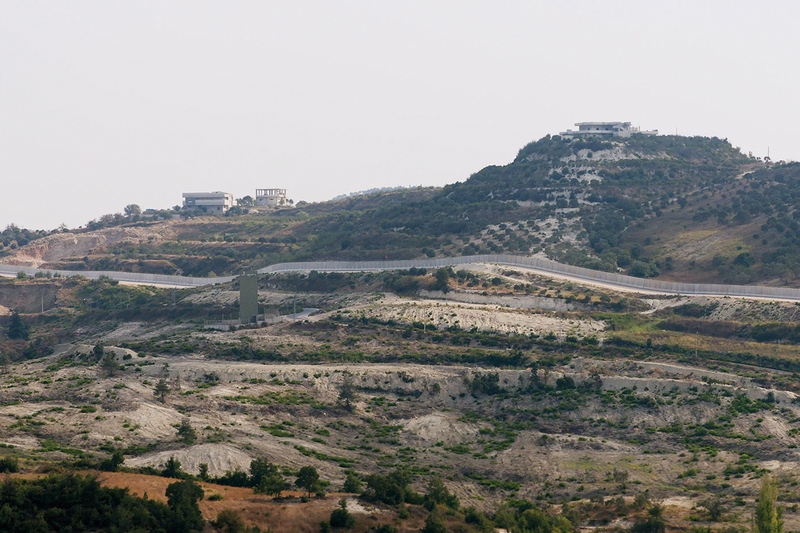 The film traces the movement of the protagonist, Abdel Aziz Mekki, through long landscape shots chronicling his journey from the outskirts of Paris, via Egypt, to Syria to join the Al-Nusra Front, a precursor of the Islamic State, and back, and offsets them with ephemera reporting on his activities as recorded by government surveillance. Can you speak about how the events in November last year shaped the project that would become Also Known As Jihadi? EB: Lately, opening a newspaper each day reminds me of a passage in Franz Kafka’s diary that goes something like this: “This morning, I watched the destruction of the world as an attentive spectator, and then I got back to work.” The question is: What is our work, and how does the chaotic order we are experiencing, manifested in killings in Berlin but also Beirut, Aleppo, Nice, Nairobi, or Paris, intersect with the work we do? Concerning the new film, it wasn’t so much the November 13 events in Paris themselves that triggered an impulse to get to work. It had more to do with the French prime minister declaring, at a commemoration ceremony shortly thereafter: “Explaining jihadism is a bit like wanting to excuse it.” A few weeks later, Alain Badiou gave a conference about the massacres in which he replied to the prime minister, saying that declaring something to be unthinkable is a defeat of thought, and therefore a victory for criminal and irrational behavior. I think my decision to get to work with the new film stems from my visceral disagreement with the prime minister, and my partial unease with Badiou’s reply. I am interested in forms that explore a space in between understanding and the impossibility of understanding. AG: The core structure of Also Known As Jihadi is based on the combination of two types of material. 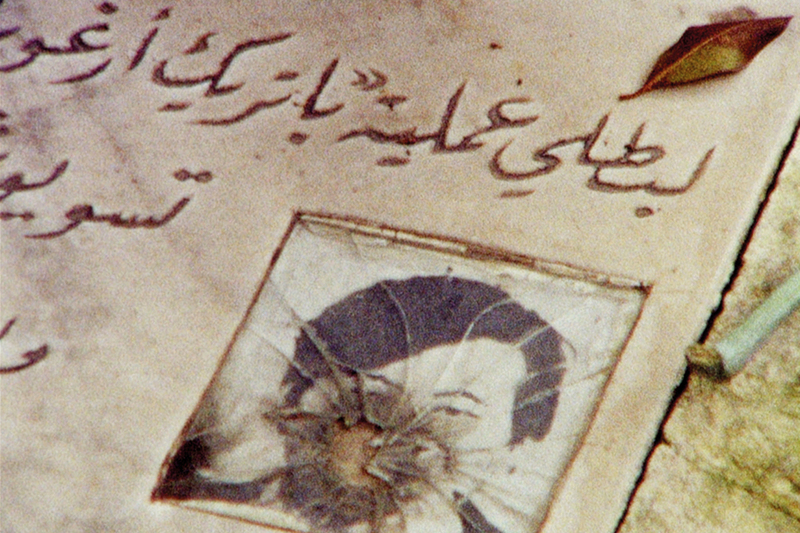 First, footage of land and terrain in the tradition of Masao Adachi’s so-called landscape theory or fukeiron, a strategy that Adachi implemented in his 1969 film AKA Serial Killer, which suggests the possibility of creating a portrait of someone through capturing the physical landscape that shaped him or her during their lifetime. And second, shots of judicial documents that follow the movements and actions of the lead character and his associates. This is not the first time that you have worked with the foil of Adachi’s landscape theory. It featured prominently in your film The Anabasis of May and Fusako Shigenobu, Masao Adachi and 27 Years without Images (2011). What made you return to it for this project, and how do you see it working in relation to the legal material? EB: The important word in your question is “foil.” I am not interested in a dogmatic way in the so-called landscape theory. Not as a disciple. I am interested in its potential to raise questions about the social and political context of a place, and the relationship between this context and the kind of alienation that leads certain individuals toward trajectories of violence. It seemed like an interesting starting point to explore the journey undertaken by the young man who is the subject of Also Known As Jihadi. But the title is also important: it implies that the true nature of this person remains hors champs, outside of the frame. The film is about what he is “also known as.” I use the landscape theory as a foil because I accept the notion that it fails, that it is inexact, that it raises questions instead of giving answers, and this is the only position I feel capable of adopting for a film like this. The same ambiguity is true about the surveillance and judicial documents that form the narrative track of the film. They tell a story. But it’s the story told by the state surveillance and judicial apparatus in the face of a phenomenon it doesn’t really know how to process. A thousand French men and women have gone to Syria. Once there, it becomes very complicated to know who traveled in solidarity with the Syrian people fighting Bashar al Assad; who has followed the path because they felt they didn’t have a place in France; who traveled with hopes for martyrdom; who will return dejected and disappointed; and who will return intent on shooting up a crowd at a death metal concert. 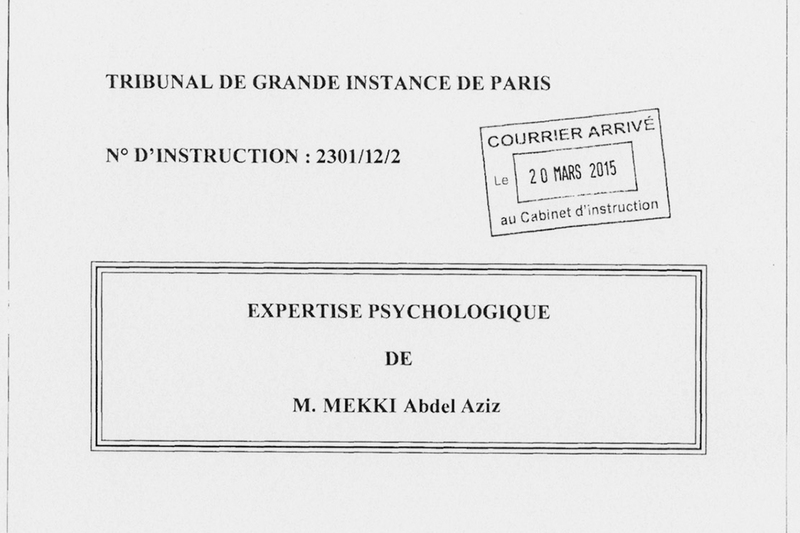 I combed through piles of court cases concerning returnees who were judged, often with a very heavy hand, in the aftermath of the November Paris attacks. I decided to look for trajectories that contained a certain ambiguity. AG: The environmental and legal landscapes that you are presenting in this film side by side are introduced through long black frames that allude to the opening and closing of a camera shutter. 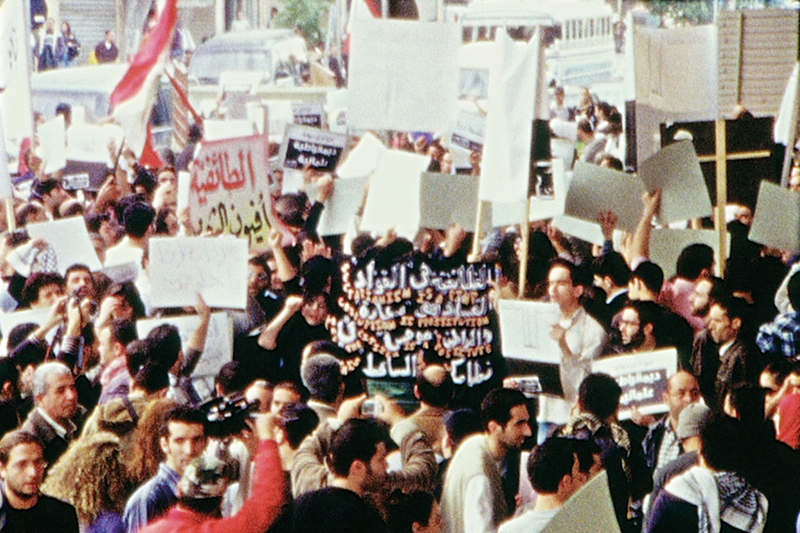 The images illustrate the text while the documents caption the images, yet the “fictional” nature of the film suspends the accustomed form of reading one as verifying the other. How do we weigh the value of one form of evidence against another? EB: I made the film from two kinds of landscapes: geographic landscapes shot with the camera, and judicial landscape revealed in excerpts of documents produced by the police and the courts. When I brought the material to the editing table, I was not working with it as evidence. I am neither a policeman nor a journalist. I’m not even a documentarian. Along with Claire Atherton, the editor of the film, who spent many years cutting films with Chantal Akerman, we looked at the material for its organic cinematic qualities. All the names of people and places were changed. It matters to me that the source material, initially, is extracted from a real situation because I am interested in making films that deal with the present for its “essential quality of being present” to cite Charles Baudelaire’s “Painter of Modern Life.” But once we start editing the film, I detach myself completely from any notion of objectivity or evidence, in favor of cinematic construction. AG: Can you give an example of these cinematic qualities that you are after, especially in regards to the role of fiction in the work? EB: It’s very difficult to put words on images. When we sat at the editing table with Claire Atherton, we watched thirty hours of footage shot on location, chronologically chronicling the life of the man we call Abdel Aziz Mekki. The clinic he was born in, the housing estate he grew up in, the schools he attended, on and on, until we reached the road in Turkey that leads to Aleppo, all the way to the border. We chose the images that are in the film by selecting those that felt “juste”. That is a French word that means something in between “just” and “accurate.” An image felt “juste” when it contained an indescribable equilibrium between the movements of the camera, the uncertainty of these movements, and the descriptive qualities of the landscape. The camera searches for something, or perhaps it allows the viewer to search for something in the landscape. But this gaze cannot be oriented in a heavy-handed way; if it does, it fails. So the image has to ask questions, not propose answers. This is the cinematic quality we were looking for. Narrative qualities, descriptive qualities as well, but I think the hardest quality to achieve in this particular film is in the emotion carried by the camera movement. AG: In many of your works, the attempt weighs more than the possibility of completion, the question over the likelihood of an answer, ambivalence over certainty. You appear to value the act of going through the motions of something without knowing its outcome when you quote Badiou’s definition of the anabasis as “a free meandering, which will have been a return, a return which prior to the wandering did not exist as a return.” Would you describe this approach as an empathetic strategy, the willingness to trace a trajectory even if it appears futile or morally unjustifiable? 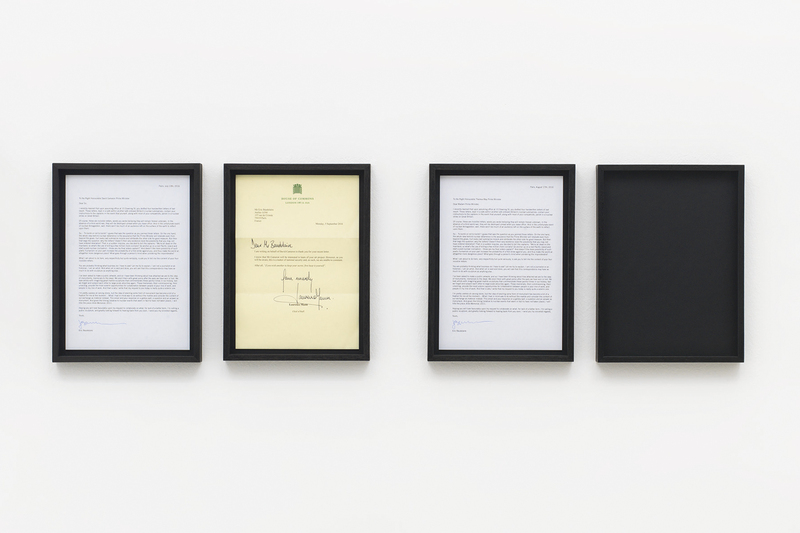 AG: “Pondering the imponderable” is an inquiry that you ascribe to the UK’s recent head of states in your letters penned as part of the work Ante Memorial (2011-ongoing). In another interview you draw a comparison between your artistic practice and the search of the land surveyor in Kafka’s novel The Castle (1926), a character who is trying to find a castle that can never be found, as its physical structure merely stands in for the invisible structures that organize communal living. Would it be apt to say that this attempt to make visible or locate traces of that which is invisible or unintelligible is a recurring motif in your work? EB: Kafka’s land surveyor knows there is a castle on the top of the hill; everybody knows there is a castle up there, invisible, wrapped in fog. But the surveying will never take the form of actual physical measurements, because the castle cannot be reached. The surveying of the immateriality of the castle takes place throughout the novel, in K’s interaction with the people who all live below the castle, in his attempts to reach the castle. I think this is the kind of peripatetic surveying we do as artists engaging with the real, in accordance with Samuel Beckett’s definition of the task of the artist: finding a form to accommodate the mess. Eric Baudelaire is a visual artist and filmmaker. 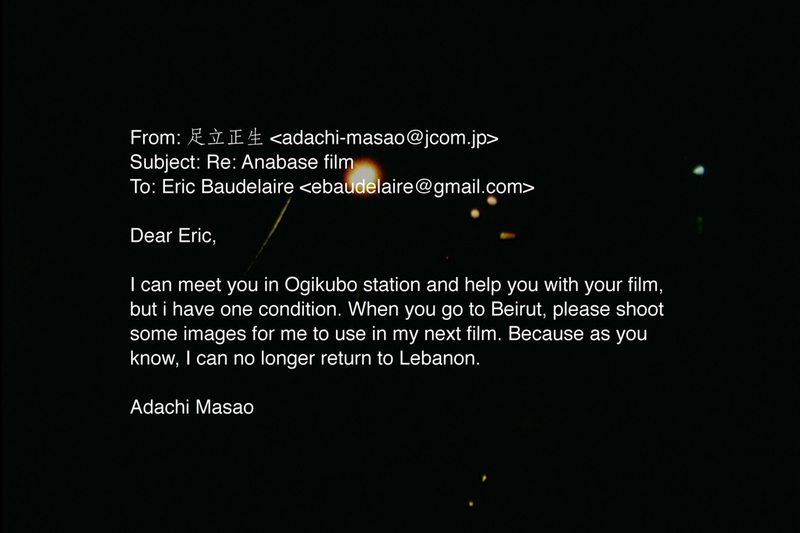 His films Letters to Max (2014), The Ugly One (2013) and The Anabasis of May and Fusako Shigenobu, Masao Adachi, and 27 Years Without Images (2011) were shown at the FIDMarseille, Locarno, Toronto, New York and Rotterdam film festivals. 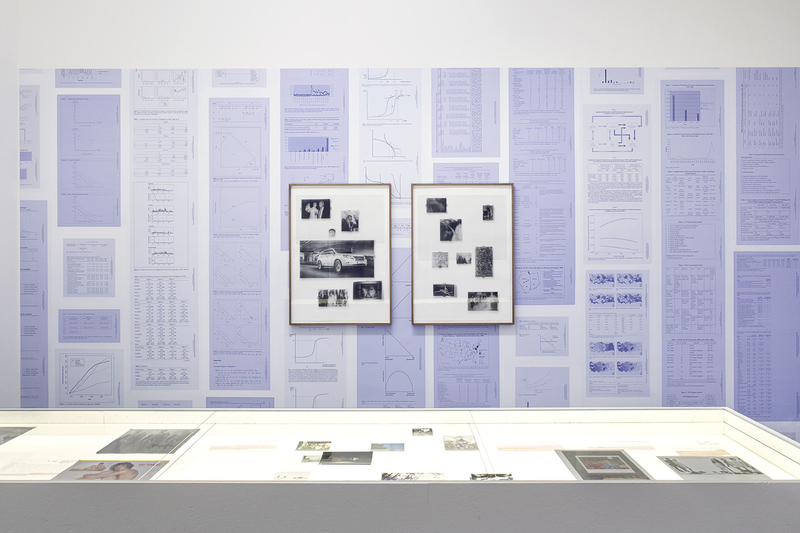 His research-based practice unfolds as installations incorporating photography, printmaking, performance, publications and screenings. 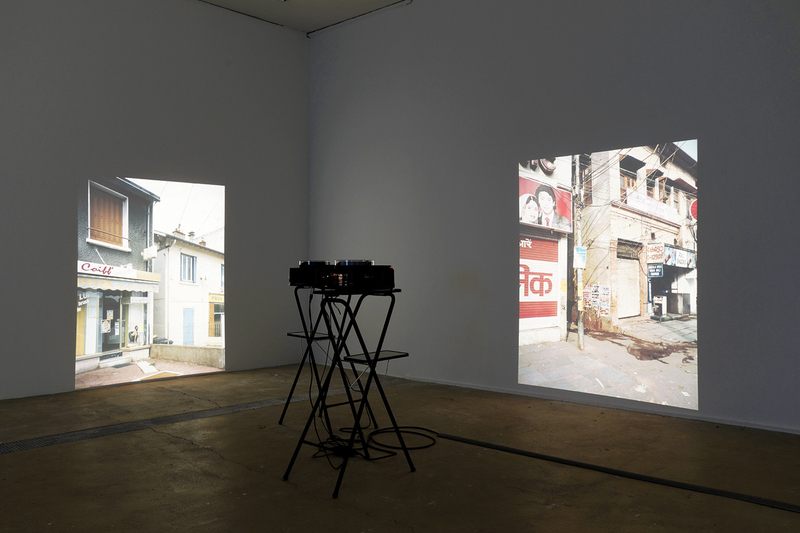 Recent solo exhibitions were held at the Fridericianum in Kassel, Berkeley Art Museum, Kadist Art Foundation in San Francisco, Bétonsalon in Paris, the Bergen Kunsthall, the Beirut Art Center, Gasworks in London, La Synagogue de Delme in France and The Hammer Museum in Los Angeles. His exhibitions include a solo at Witte de With, the Whitney Biennal 2017, and Centre Pompidou, Paris in the fall of 2017. Anna Gritz is the curator of KW Institute for Contemporary Art, Berlin.